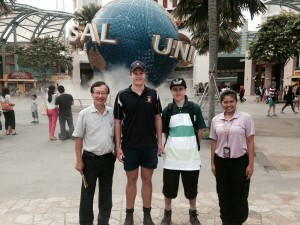 Benjamin Carter and Joel Tabaka, two standout horticulture apprentices, have just returned from an inspirational weeklong study trip to Singapore, made possible through a Skilling Australia Foundation Scholarship for Excellence and Leadership. Hosted by Paul Brook, one of the Skilling Australia Foundation’s managers, the two budding horticulturalists had a jam-packed schedule in Singapore. The schedule was designed to provide the hands-on, soft-skills that the apprentices need not only to land, but also keep, a job in the real world; skills that apprentices are unlikely to glean from a more traditional classroom setting. Joel was similarly inspired by the trip, in a way that traditional classroom education could not achieve. “The trip has opened my eyes to the different techniques used in horticulture; how different countries have different practices due to climate, workers, funding, and time. It’s made me more aware of what’s out there in the world of horticulture. Just because we do things a certain way at work, doesn’t mean its the only way to do something. I learnt basically everywhere we went. I tried to act like a sponge, absorbing as much as possible. Everything from costing of projects and work ethics to horticulture techniques,” said Joel. Benjamin and Joel visited the award-winning Tanah Merah Country Club, a golf course with the air of a large, tropical garden made possible by extensive irrigation systems. Here, the apprentices spent the day overseeing operations with the Assistant Course Superintendent and Horticulture Manager. Next on the itinerary was Prince’s Landscape. One of the oldest nurseries in Singapore, Prince’s has more than 50 years experience. Starting out as a small flower shop, Prince’s has evolved into a full-fledge landscape design and installation specialist, employing 300 horticulturists, designers, engineers, and florists. The team from Prince’s hosted a number of site visits, including ongoing landscaping at the Ng Teng Fong General Hospital (a project worth more than $6 million), and landscaping maintenance and operations at Changi International Airport. Nature Landscapes, another local landscaping firm also shared its insights with Joel and Benjamin. With more than 30 years experience, over 500 employees and a nursery spanning over 5-hectares, Nature Landscapes has created an impressive portfolio that includes hotels, golf courses, and public and recreational grounds in Singapore. Mr Michael The from Nature Landscapes organised a tour of some of these portfolio pieces, including ITE College Central and The Star Performing Arts Centre. The highlight of the trip was the Singapore Flower and Garden show, where Benjamin and Joel were able to meet with international landscape designers, and enjoy exhibits such as the Orchid Extravaganza, the Landscape and Fantasy Gardens, and Floral Windows to the World. With the exhibition held at Gardens by the Bay, Joel and Benjamin even had the opportunity to explore the 100-hectare site, which comprises three impressive waterfront gardens. Last, but by no means least, the group toured Resort World Sentosa. Opened in 2010, and spanning more than 49-hectares, the site is home to the Universal Studios theme park as well as Marine Life Park. Mr Kok Yeang provided a tour of Resort World and the Marina Bay Sands Hotel, explaining the challenges and the day-to-day operations of its horticulture program. Benjamin is currently enrolled in the Certificate III Turf Management (Sport) course, and has been employed at Haileybury College for approximately 18 months, undertaking a variety of grounds management tasks. He was recently named the most outstanding first year apprentice at Northern Melbourne Institute of TAFE. Similarly, Joel is completing a Certificate III in Horticulture (Parks and Gardens), and is a well-respected member of the Hobson’s Bay Council Parks Team. The two young horticulture apprentices were both awarded a Skilling Australia Foundation Scholarship for Excellence and Leadership, funded by The Percy Baxter Charitable Trust and the Eddy Dunn Endowment through the Perpetual Foundation. The Skilling Australia Foundation regularly offers merit-based scholarships, to fund short study trips, to students who demonstrate a high level of academic achievement, leadership skills, and other outstanding abilities, or who have contributed to the community through their chosen profession.